Farrier's Finish is a hoof ointment that destroys the microbes, which cause white line disease (seedy toe) and thrush. It is also useful for helping to maintain moisture balance in the hoof, when weather conditions are excessively wet or dry. 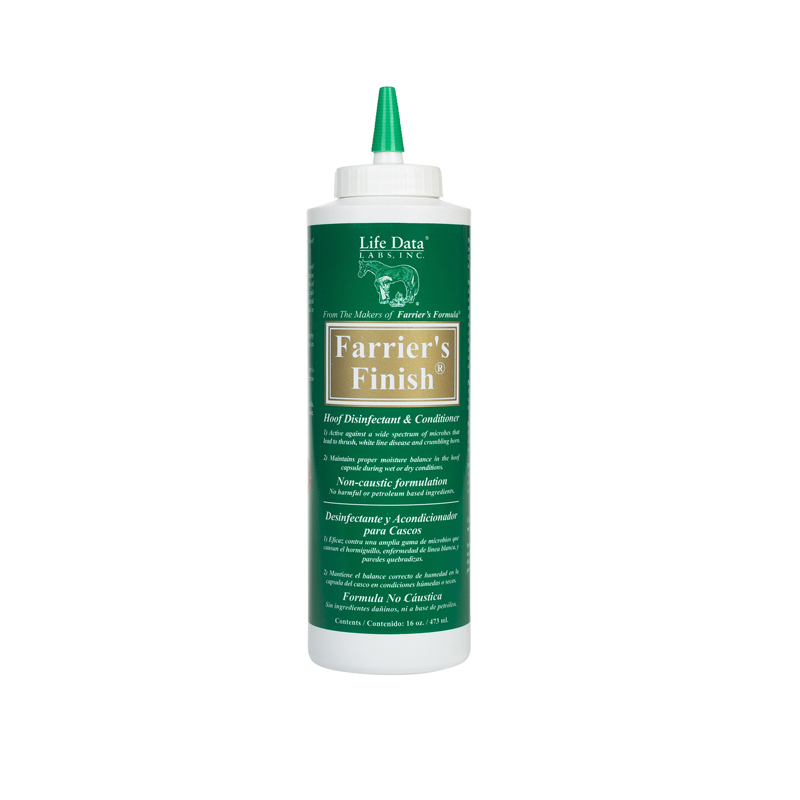 Farriers Finish is a fantastic addition to anyone’s hoof kit and an essential for those of you with horses who suffer with hoof cracks, crumbling hooves or recurrent infections of thrush or white line disease. Farriers Finish is based on a natural recipe, so no harsh chemicals are included. Lecithin extract: Provides a breathable protective layer to keep moisture in. Amino and Fatty Acids: Allows the ointment to penetrate into small cracks and defects in the hoof capsule. Tea Tree Oil: Has strong tissue penetrating capabilities and mild antimicrobial activity. Iodine: Provides antimicrobial function with minimal tissue irritation. Yucca Extract: helps to neutralised ammonia absorbed by the hoof as a result of standing on urine soaked bedding. Available in a 473 ml bottle. We recommend applying Farriers Finish with a sponge. For Hoof Problems: Apply daily to entire hoof (coronary band, wall, sole, and frog). Special attention should be given to the white line area at the junction of the sole and the hoof wall and any other areas of concern. As a Hoof Protectant: Apply when needed (during excessive heat/ wet & dry conditions) and then at regular intervals, as a gentle disinfectant.